or any other thing you might want to paint! The "secret" is how darn easy this is! I certainly hope it didn't sound like the painting of the drawer pulls was some difficult or complicated secret. It certainly isn't. It's quite simple. Don't worry about changing it to suit your needs, go right ahead, it is very adaptable. Over the years, this has been one of the most asked questions, how to create this look. So here are the directions! The drawers pulls only appeared to be more complicated to paint than they actually were. When I looked at the ones I had painted previously, I wanted to replicate the look but I wasn't sure how I had done it. No notes left behind as usual. After figuring it all out again, it was written donw, and I am happy to share the "secret" with you. This is what the handles - drawer pulls look like in their unpainted state. The pulls you see here are brass, and vintage. They were not primed, but you may wish to do so with yours. They will not get a huge amount of wear and tear in a spare bedroom or studio area compared to a kitchen or bathroom. 1. START CLEAN: Clean them very well! The drawer pulls should be very clean, and totally free of oil, grime and dirt Use a scrub brush to get into all the areas. 2. PRIMER: Judge if you need to use a primer by the condition of the metal, and by how much use you think they will get. The heavier the use, or the worse the condition, decides if you need primer. I usually do use primer. This time I didn't need to because this old brass takes the paint very well, and was in good condition. 3. BASE COAT: Using Spray Paint, spray the hardware with a dull gold paint made for metal. Dull is better, and you should use a spray paint that says it is for metal. 4. 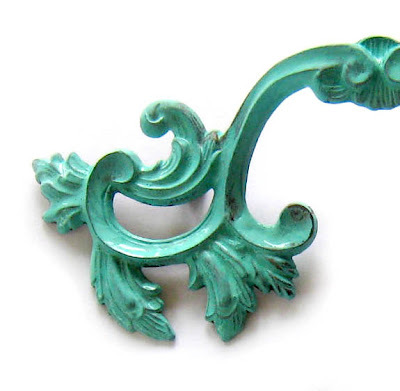 ADD THE BLUE: Now you have the metal primed with a coat of dull gold, so you can now add a coat of turquoise blue with craft paint or acrylic paint. Paint them all over with the Turquoise paint, getting into all the crevices. I used one of the craft paints that I used to custom mix to match a Tiffany blue bag. 5. WIPE OFF THE EXCESS: Using a soft cloth, wipe off the excess on the higher areas of the pull before the paint dries. And it will look like the picture below. If you find that you are having a tough time because the paint is drying quickly, simply dampen your rag. Old t-shirts or cotton socks are great for these projects. Even at this stage, the hardware is beautiful. You could leave them just like this if you wish. They already look wonderfully aged. 6. Let the paint dry completely. 7. ADD GOLD ACCENTS: As you can see, this step takes your gold accents to a deeper and prettier look that the base coat the you exposed. But it is an added layer to the duller gold. 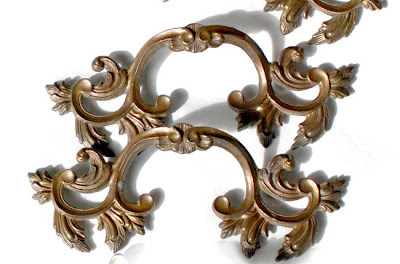 After the paint is totally dry, using either Treasure Gold OR Rub-n-Buff metallic finish. Put a small amount of the gold "wax" from the little pot (Treasure Gold) or the tube (Rub-n-Buff) on a soft cloth wrapped around your index finger and rub just the top surfaces of the pulls. I always wear cheap latex gloves while doing this because it is metallic and some can stay on your hands or fingers until cleaned off with a solvent. This gold is a bit shinier and brighter than the dull gold you started with. So now you have different layers of golds that add to the aged look. 8. SILVER AND GOLD! : This is an old trick that I think is worth it although the look is subtle. If you would like another layer of interest, as in mine below, I alternated a silver metallic with the gold, over the turquoise painted hardware. 9. PROTECTIVE SEALER: If this hardware will get a great deal of use, you can use a spray (or brushed on) polyurethane or acrylic topcoat. I usually use the spray kind. The rub and buff wax product does a good job of sealing, but somethings might get excessive use where the finish could be deteriorate over time. Let it dry thoroughly before using it. What is Rub-n-Buff or Treasure Gold ? I'm sure most of you know by now, but in case this is a new product to you, it is a wax that has metallic powder pigments added to it. After you apply it, you buff it just like any other wax. You can use it over metal, plastic, paper, ceramic, plaster.... lots of things! It seals like a wax and looks like metal. I know exactly what you mean about the warm Gulf waters...that's why I love walking along the coast line at night...the air is high 70's and the water feel like a bath tub. Silver and gold r'n b together? Who woulda thunk? Definitely keeping this in the idea file! In fact I have been looking for turquoise accents everytime I shop. Those pulls are sooo beautiful! Thanks for explaining how you did it! Thanks for sharing this. I love the look of patina. I will be trying this on my bedroom set. that is way cool! thanks for sharing! Beautiful drawer pulls. I loved your tutorial and have just discovered your blog, which I also love. How exciting to find a new blog that I love! So happy I came across this awesome blog! I love these! I have the exact same pulls as the tute on a dresser of mine. This is perfect for my coming refinishing project. Only one problem. Somewhere along the lines of passing down the dresser lost a pull. I need a replacement so badly! Where did you get yours? The drawer pulls came with the dresser. BUT when I need one like these that was missing from another piece, I purchased 2 of them on EBAY. There are often many different one available there. Also, thrift shops and junk stores might have one or two. Thank you for re~posting this Donna! 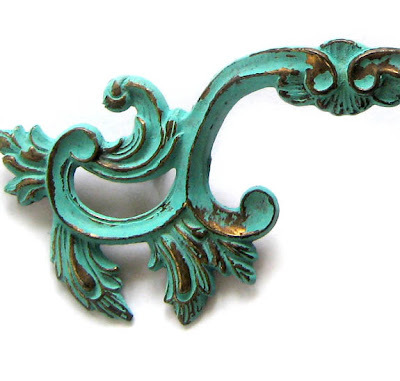 Your pulls are Turquoise and golden wonder perfection! I've never used rub and buff. Will look into it. Hugs to you and have a wonderful and creative week ahead! Thanks for sharing your tips!!! I'm going to try this finish out for sure! Very cool! Thanks for the tutorial. Can't wait to get my hands on some french handles now. 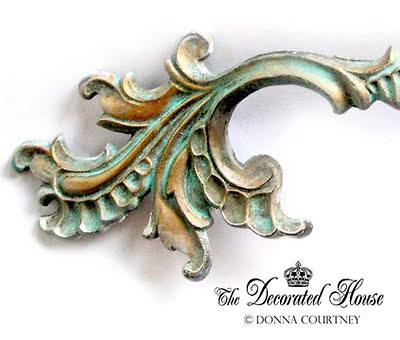 This seems like such a beautiful and easy way to add some class to my old drawer pulls. What kind of turquoise paint did you use? I didn't know about that wax! Thanks for the tip! I am going to post this on my facebook page!! I was wondering if you'd be willing to divulge your recipe for the turquoise you used? I am having the hardest time finding a turquoise I really love and yours is just beautiful. Thanks so much. Hello Jane, If I had the name of the color I would be happy to share it. I had a couple of cans of turquoise paint that I had color matched at either Lowe's or Home Depot. In this post I talked about how to get the perfect color by using craft paints first to mix what you want, then having it color matched. I hope this works for you. Just keeping mixing 2 or 3 turquoise bottle, or green, or blue, add white if needed and you get test many different colors.